First off, we needed some springs. 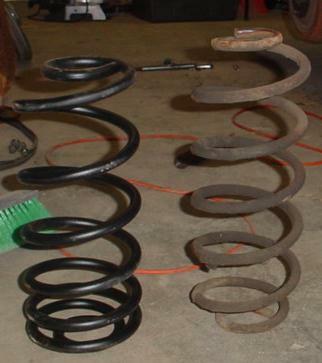 NAPA was able to get us some variable rate rear springs for $79 (incld tx). You can see that it appears that the newer black spring is shorter...and it is. However, because the "rings" are compressed tighter near the bottom, it actually has more compressive force to it. Long story short, the top of the rear bumper went from 26.125" to 29", or just about a 3" lift. On a side note, it's also easier to put in shorter springs. 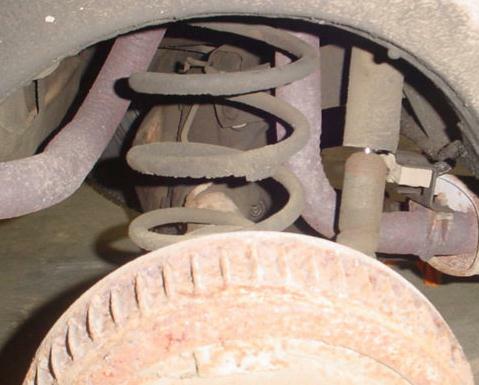 For those of you who don't know how to change rear springs on a RWD car, it's just a matter of jacking the rear of the car and supporting it from frame. This allows the rear end to hang down. To again additional travel, the shocks are disconnected. Then it's just a matter of prying each spring out and replacing it with a new one, noting the orientation of the old spring before installing the new one.